I draw Visio diagram very regular but have been very motivated to create more and more dynamic diagram that only require the artistic touch to make the diagrams look the way you want. There should be no reason to waste time typing in data if you already have it in a Excel Spreadsheet, SharePoint Foundation List, or DB. I am using Excel Spreadsheets for this example but you can use whatever you want. There is additional things you would need to do to make it work obviously. To do all the drawing you can do it in VBA, PowerShell using the Visio module/plugin, or C# (I will learn this one day). I have decided to use the Visio module/plugin for PowerShell by Saveen Reddy because it is the quickly to learn and use for me. He is the author of a larger project call Visio Automation. I did create my own Stencil Pack and added my Data Graphics to it. I prefer to create diagram that has simple hostnames (that are unique) so they can be linked using the external data concept in Visio and use the Excel Spreadsheet, SharePoint Foundation List, or DB options. Since I use the unique hostname as the key in the XLS I can match that to the name of the shape on the page. I can then populate the Data Graphic with all the data from the external data. I also keep a connection list in a format of C followed by any number of digits. This allows the WAN links to be linked to the external data. Here is a little of useful powershell to quickly select the specific shapes all at once. # If the Visio plugin for PowerShell doesn't see a connection to Visio connect to it. # Sometimes you will need to also attach to the document. My Script requires input from a file in the following format. 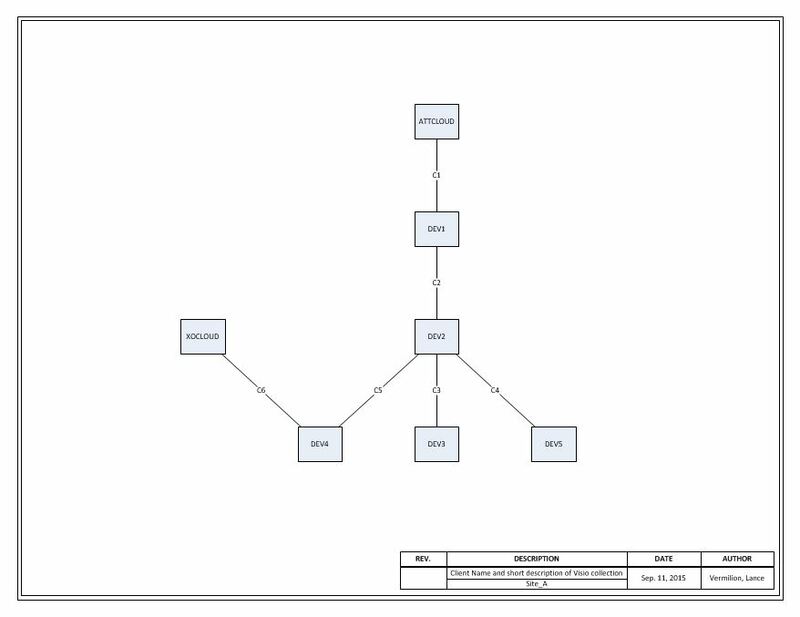 label = "Name of Page/Document in Visio"
Currently Connector_Label is ignored but could be used for different implementations. # You would have to comment out the following three lines since you likely don't have them in a Stencil Pack like I do. # You would have to comment out the following two lines since you likely don't have them in a Stencil Pack like I do. Here is a picture of what it would draw.